Alberta Energized hits the Cabot Trail! Last Wednesday I hit the air for a 5000km trip across the country to run part of the Cabot Trail, more specifically, MacKenzie Mountain. 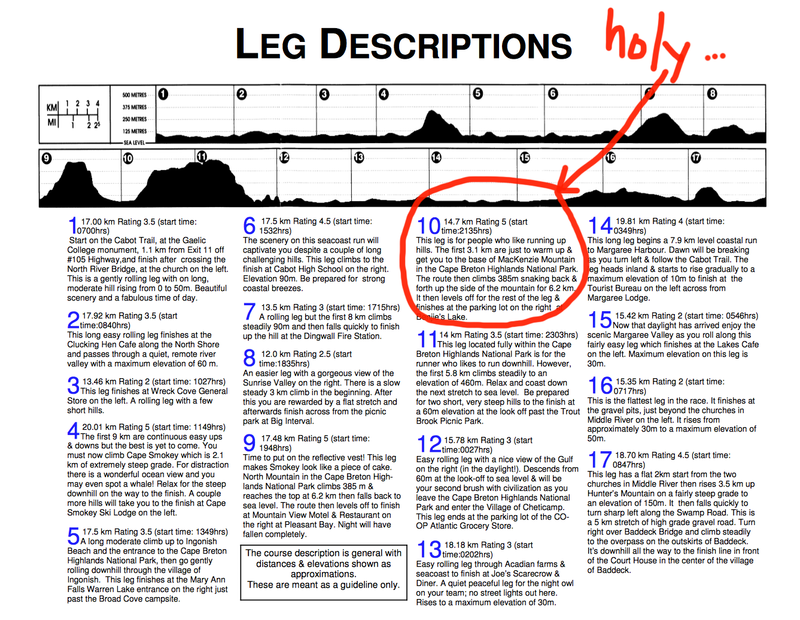 This part of the relay is described as, “A leg for people who enjoy running up hills. 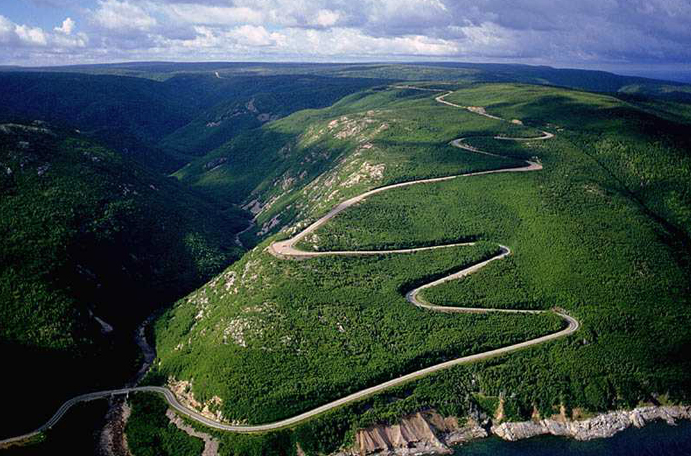 The first 3.1 km are just to warm up & get you to the base of MacKenzie Mountain in the Cape Breton Highlands National Park. The route then climbs 385m snaking back & forth up the side of the mountain for 6.2 km. It then levels off for the rest of the leg & finishes at the parking lot on the right at Benjie’s Lake.” It was rated 5 out of 5 for difficulty (I couldn’t agree more.) However, I absolutely LOVED the challenge, here’s why: I am not built to be a runner, in fact I have to work really hard to run so this was the perfect way to keep myself on track with training and keep moving forward. Earlier on the Saturday, we followed the relay from legs 2 to the end of 4 (Smokey Mountain.) We headed back home to rest, eat and prepare for our own legs; mine was scheduled for 9:40’ish at night. I got home, rested for about 45 minutes, got up, showered, ate a bagel, drank some water and we hit the road. The drive was about 1.5 hours out to the start of my leg. I got pretty anxious because we went the opposite direction so we actually drove down the mountain I would run shortly after (it was steeper than I had remembered!) I followed my regular pre-run routine, warmed up, drank, ate again and used the facilities (port-a-potties = yuck.) Just before we were ready to start, they announced that there was a moose at the 3km mark (fantastic, right?) That bulletin really threw me off; my nerves were all but shot. When we started, I just took my time (slow and steady) I had a finish time in mind but I didn’t want to push myself as I’ve had a fairly tumultuous few weeks with a dislocated arm, major fatigue for several weeks and overall, the effects of travelling across the country! The 3km to the base of the mountain were quite enjoyable; I liked how cool & dark it was outside – it was peaceful; but in the back of my mind I was terrified of the animals who may have been lurking around! The fog was quite thick and the mist began as we climbed higher up the mountain (I found it kind of creepy.) The first kilometre up the mountain I ran, and then I remembered that I had a strategy to give myself a break (someone who had done the run before told me not to expect to run it all, that I should run/walk.) I followed their advice. I can’t even explain how steep some parts of the run were; it felt like if I stopped I would fall back. There were also parts of the run when there were no cars or people around, it became kind of lonely! After a fairly difficult ascent to about 12km, I got cramps in my left toes – I have never had this before, so I was shocked! I had been feeling so strong and great that it really threw me off. I did some stretches and then continued on; the rest of the run was fairly uneventful… just quiet as we weren’t allowed to use music (BORING!) Fortunately for me, I memorized the Nike commercial referring to the grind. It helped to repeat it over and over to get my mind off the creepiness of being out in the middle of nowhere, in the middle of the night! I finished the run at exactly the time I had planned to. I was really pleased that other than toe cramps I was not sore at all (not calves, not quads, nothing!) When I talked to someone about this a day or so later they told me that if I wasn’t sore I could’ve worked harder… I felt like telling them to French Connection themself! I thought it was pretty impressive that given the fact that I’d had a rough two months prior to the run, that I had completed it without an excuse or complaint, and that I wasn’t sore – I had done pretty damn good! It was awesome to get home to Cape Breton with the Alberta Energized team. I think most people enjoyed themselves and it looks like there is interest to do it again next year. I’m thinking maybe I’ll run North Mountain, but time will tell! Congratulations to all runners who ran the 2014 Cabot Trail Relay! This entry was posted in Cabot Trail Relay. Bookmark the permalink. Sounds like you and all the participants did an amazing job this year. It’s inspiring to hear you talk about having rough times and still being able to complete the run. Nice work Kat!